Like the rest of the Flaggers’ 40 or so members, Cooper feels pride and reverence each time she displays the flag in public. If the flag was a racist symbol, Cooper argues in the video, she wouldn’t be an accepted member of a group composed primarily of white Southerners. Confederate memorials and the flags that often accompany them have faced renewed scrutiny following the racially motivated shooting in Charleston, S.C., that left nine parishioners dead in a historic African American church this month. Across the country, statues memorializing Confederate dead have been mocked and defaced as pressure mounts to remove what many view as enduring symbols of white supremacy. 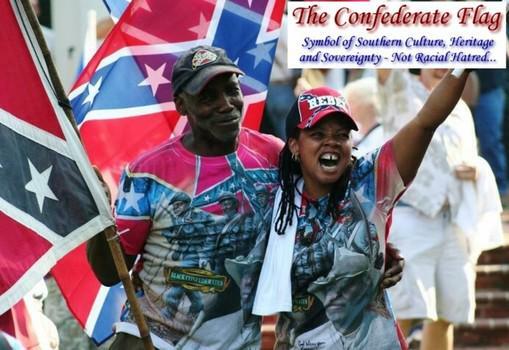 While black Americans are assumed to be uniformly opposed to the Confederate flag flying over government buildings, polls of Southern blacks suggest opinions about the flag are more complicated. A 2014 Winthrop University poll found that 61 percent of black South Carolina residents said the flag should no longer fly on the state house grounds, The Post’s Aaron Blake reported last week. And yet, 27 percent of black South Carolinians said it should stay — suggesting that the flag’s meaning remains a source of some debate. Byron Thomas, an African American student at the University of South Carolina, understands why people hate the Confederate flag, but he told CNN that he doesn’t feel like the symbol is racially offensive to him, even after alleged Charleston shooter Dylann Roof was photographed posing with the flag. Thomas said he hung the flag in his dorm room at the University of South Carolina Beaufort to honor an ancestor who was a cook for a South Carolina regiment during the Civil War. When the university protested, Thomas fought back and eventually won. Like other black defenders of the Confederate flag, Thomas argues that the symbol was stolen by hate groups, leading to its banishment from many public settings. Taking down the flag, he argues, is the same as letting the racists win. Courtney Daniels — a black Birmingham, Ala., native and Marine — argues that the Confederate flag and its “gorgeous colors” were hijacked by “a few cowards in bedsheets,” obscuring its rich history. “I revere it as a son of the South in a way that would confuse those on the outside looking in, who by the way are not entitled to commentary on which flag waves in our humid Southern breeze,” he wrote in the Birmingham News opinion pages last week. Daniels noted that he didn’t always support the flag. He grew up believing that the flag was a symbol a racism until he started researching Civil War history and eventually concluded that he had “foolishly labeled every white person sporting the flag as a racist.” It is not the South, but northern cities like Philadelphia and New York, he argues, in which black Americans are defined by their skin tone. In Asheville, N.C., last week, hours after “Black Lives Matter” graffiti appeared on a monument commemorating the state’s Civil War governor Zebulon Vance, an African American man stood nearby with a Confederate flag, defending it to anybody who would listen, according to NBC affiliate WYFF.